Each SMTDS Instructor has over-the-road and driving instruction/training experience. 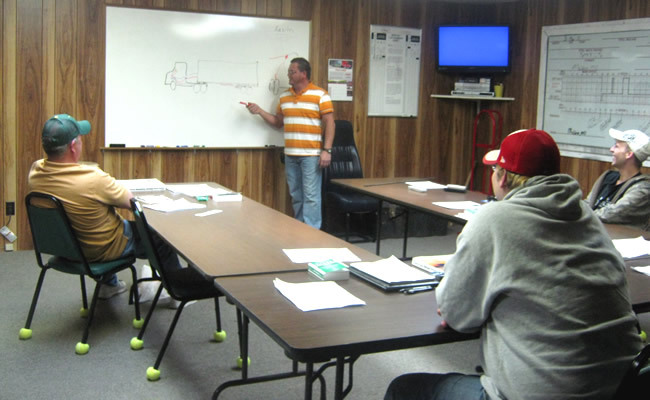 Our instructors have a variety of experience in all aspects of the trucking industry. Each instructor's individual qualification are available upon request. Call or write SMTDS for details. Students at Southern Missouri Truck Driving School are taught by experienced instructors who never have more than eight students in the classroom. The SMTDS classroom is well lighted and ventilated with over 400 square feet of space and fixtures are designed so that students are comfortable. Visual aides are also used for showing videos of truck driving safety and training. Our Scott City location is 240 sq. ft.
Students will spend the first week of school in the classroom where training begins with basics of driving a tractor trailer including the language and laws of truck driving. 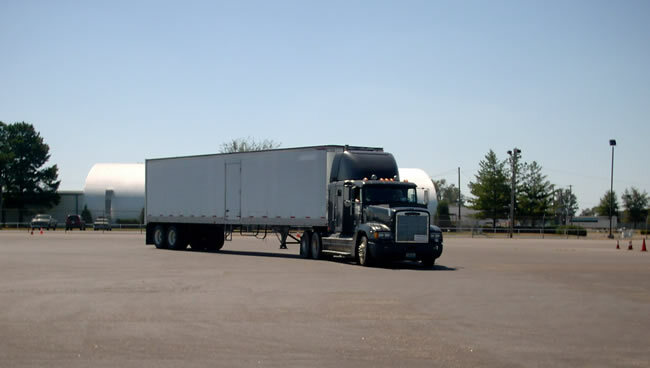 The SMTDS backing pad covers approximately five acres of room for practicing, pre-trip coupling and uncoupling, post-trip and different backing maneuvers such as straight line, offset alley, parallel parking and different alley docks. In addition, our 1/2-mile by 60-yard runways allow students to practice everything from backing to shifting while being in an off-road protected area before getting into traffic. Ratio on the backing pad is four students to one instructor. This option is not available in Scott City. Over-the-road instruction will be done in well maintained equipment like those being used in today's trucking industry. Equipment includes four conventionals and one cab-over tractor with 45-foot to 48-foot dry box trailers of varying weight. While driving the different equipment, students can expect to drive on interstates, doing on and off ramps. Driving will also take place in cities and on hills over federal, state and county routes within 100 miles of SMTDS. During this phase there are two students to one instructor. Students can expect at least 44 hours behind the wheel. Night driving will take place during the fourth week of training. Ratio of students to instructors will remain two-to-one during this phase. SMTDS offers free living accommodations to all men and women while attending driving school. Semi-private housing includes twin-size beds (linens are not provided), shower, refrigerator and microwave oven. Students supply their own meals. Local phone is within the living quarters. No pets are allowed on school property. Twin-size bed linens (sleeping bag) and pillow. Food (SMTDS does not supply meals). Towels, soap, shampoo and other personal items. Students must provide their own transportation to and from school. We invite you to contact the school online or by phone at 1-888-276-3860 if you'd like more information or if you have questions.